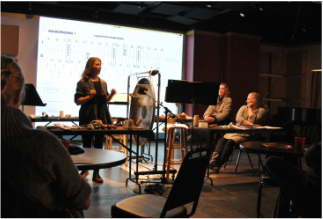 Join Zeitgeist for a glimpse into the 2018 composer workshop, featuring music by composer participants Joe Horton, Brett Wartchow, and Tiffany Skidmore. The Zeitgeist-Composer Workshop, made possible by the Jerome Foundation, is a five-day workshop designed to give emerging composers the opportunity to develop creative ideas and stretch their artistic boundaries in an environment that celebrates exploration and experimentation. Lowertown Listening Sessions invite curious listeners to enjoy adventurous sounds and insightful conversation with the music-makers of our time. Held at Studio Z, Zeitgeist’s performance space in Lowertown St. Paul, this monthly happy hour series brings guest artists from all genres of new music (jazz, classical, world music, folk, and more) for performances and informal discussion in an after-work setting with food and beverages from Lowertown eateries.